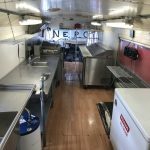 Find food trucks for sale in Montana by owner. Montana is a massive state, but most food trucks operate within the cities of Bozeman and Billings. Similar to other Midwest states, a lot of mobile food units only operate during the spring – fall months. Get details of each of our listings by selecting the profiles listed below. You can find contacts information for each of the trucks and trailers to schedule an appointment to view inside the listing. Make sure to inspect any vehicle in person before making a purchase.